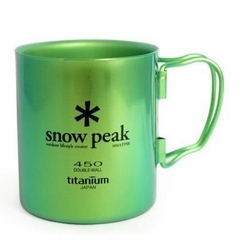 This double wall titanium mug holds 14 oz of liquid, and will keep your beverage hot longer on a cold day. Add a fitted sipping lid (optional) to extend the heat even longer. These mugs are colored with an electric ionization process which bonds to the titanium. The result is a safely coated and vibrant colored mug. Dimensions: D 3.4" H 3.8"